The whirlwind trip of 10 days,on the island of Sri Lanka exactly a month ago, was filled with some of the most unforgettable adventures and experiences I have ever had. I also believe I have transformed my partner in crime , Shilpa into a backpacker from a tourist.We not only grew a year older but also got up close and personal with the landscape, met many loving and extremely curious locals, climbed local mountains in Kandy, reenacted Bollywood moments in the tea fields in the quaint city of Nuwara Eliya, visited ancient Buddhist ruins at Dambulla and Sigriya and tried to explore every bit of our route until we hit the tranquil yet energising West coast. I am going to be using this post only to map our itinerary, allowing you to plan your own backpacking trip and give you a taste of our experiences in this backpacker paradise. I believe each town and route deserves a story of its own . Sri Lanka is blessed with gorgeous destinations, luxury resorts and getaway retreats but Shilpa and I had decided to turn this into a backpacker’s holiday. We ended up doing a lot more than we had planned and also managed to stay under our $50/day goal. Arrival in Sri Lanka: I arrived in Sri Lanka without my co traveller; we were lucky to had managed to get on board our flights from our respective destinations especially since we had spent the whole of the last week keeping a close eye on the rains and the flood situation in Chennai, a stopover for most flights to Colombo. We held on to our lucky charms until we dodged each warning of flights getting significantly delayed or cancelled and until each of our flights took off to head to Colombo. Day 1 -Negombo: Bandaranaike International Airport is the main international airport serving Sri Lanka and one of the most back packer friendly airports even at 2:00 am. You could land at this airport without a plan and within a few hours get everything done right from getting your local sim and connection to meeting people planning the same leg and to mapping your next few days with ease. Of course cost of taxis from the airports are marginally higher but a number of travellers chose to get a taxi straight to Kandy from the airport as you get on to the Kandy highway as you exit. 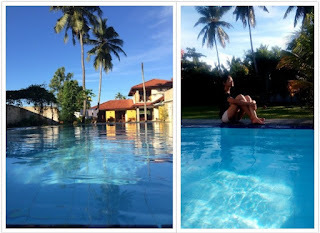 Shilpa and I decided to get a nights rest at a local Airport hotel 5 minutes from the International airport and booked a budget accommodation /family villa stay.We woke up to great weather and a gorgeous back yard and amazing service at the Airport Villa. Day 2 -Colombo – Kandy: Getting from Negombo - Colombo is a 1.5 hour taxi ride, but since we were heading straight to the Colombo Railway Station we chose to use the most reliable budget option of the Express Bus that heads straight from the Airport Departure gate to the Colombo Fort Bus Terminal. As we were planning this trip we were advised that trains were the best way to cover the long distances in Sri Lanka (well now I definitely add a Tuk Tuk with a friendly chauffeur on that list as well) , keeping that in mind we pre booked our Rajdhani Train Tickets (First Class AC carriages on the same train). The Rajdhani online booking opens only 2 weeks in advance to the date of travel so one must keep a close eye on the booking window. However you could also visit the local extremely welcoming train station soon as you arrive Colombo and sort everything out there. There are definitely a number of lingering reminders of the influence of the British Colonial era . Day 3 -Kandy: Sri Lanka's second largest city perfectly located in the mountainous region of the Island serves as a great stop to explore a number of historical caves and temples in the region. We chose Kandy as our base for this day as I had planned the Sigriya , Dambulla and Pollonawura Day trips from here. Do not expect any night life in Kandy but enjoy walks and trails around the beautiful city defined by the Kandy Lake (බෝගම්බර වැව KiriMuhuda in Sinhalese). Kandy is home to the well-known Sacred Tooth Temple located in the centre of this lake and the city. Kandy is also home to a number of Batik artisans in the region so a visit to the local Batik factories is a must. Quick Tip: A quick walk around the Kandy lake is a must but definitely keep a lookout for for giant monitor lizards that are are seen around the banks. Day 4 -Sigriya & Dambulla: I had built our SL itinerary around this destination. It was not only the day I got older but also the day we were to visit the ancient city and the ruins of the opulent palace built by the King Kassapa (477–95 AD). The Lion Rock is breathtaking and allows you to experience the vision , grandeur and tragedy of the history of the palace. The climb to the top of the rock is an experience, there are about 1200 steps that magically merge into the rock and take you to ruins of the Sky Palace. Along the way we stopped at the 1600 year old Frescoes, the Lions Paws that at one time protected the entry into the innermost sanctum of the palace. One would have to go through the lions mouth ,sadly today only the paws are intact. Even today the ruins at the Sky Palace glow, all the steps are made from moonstone that shine under moonlight and glow like gold under the sunlight. I will definitely dedicate a detailed story to this Heritage site and probably even plan a trip back just to spend a few days around the Lions Rock. We discovered a quaint café in Sigriya that served the perfect Sri Lankan rice plate meal (delicious enough to turn me into a vegetarian) ,soon we decided to rush to the Dambulla caves and climb another to this sacred pilgrimage site preserved for over 22 centuries. I have been told that Dambulla with its five sanctuaries is the largest and best-preserved cave-temple complex in Sri Lanka.A peace and the calm at the monastery definitely allowed me to realise the importance of the key teaching of Buddism of not looking at life or a situation as good or bad but just ‘Being’. Quick Tip: Carry your rain gear...IT WILL RAIN ! no matter how sunny it is that day. Day 5 - Kandy - Nuwara Eliya:The journey from Kandy to Nuwara Eliya can be covered by either train or road. However the road journey is much faster and allows you to make a number of stops at the heritage tea factory , at the magnificent waterfalls at the village of Ramboda and through thousands of acres of lush green tea fields sprinkled with tea pickers in colourful outfits. I definitely have a new found respect for tea and the shades of 'chai'. Day 6 -Nuwara Eliya: As we got to Nuwara Eliya were sure we had made the right decision of escaping to this nearly English town.Other than the weather and the toy-town ambiance does have a English country village feel to it and is charming reminders of Colonial era in Ceylon. It epitomises everything a modern day village with history should be a green golf course , a quaint post office , backyards with vegetable gardens and French bay windows adorned with flowering plants. 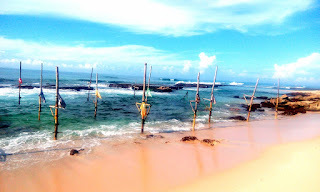 We networked with the local and managed to convince a young lad to take us to Galle and allow him to experience his country like never before . We were sure this 6 hour journey would take us much longer as we had decided to stop at every tempting village that we drove through. A key stop over on this roadtrip was the hike into the Ravana caves. According to legend based on the Ramayana, it is said that Ravana (who was the king of Sri Lanka at the time) had kidnapped princess Sita, and had hidden her in the caves behind this waterfall, now simply known as the Ravana Ella Cave. Maithili (me) has been named after Princess Sita so we all felt like I owed this unplanned climb in my flipflops to my name . As you approach the coast the greens change to shades of blue, you are welcomed by the breath of fresh air and the whiff of the salty sea breeze. As you hit Matara you drive by an expanse of powdery sand and crystal-clear water glitters in the sun. 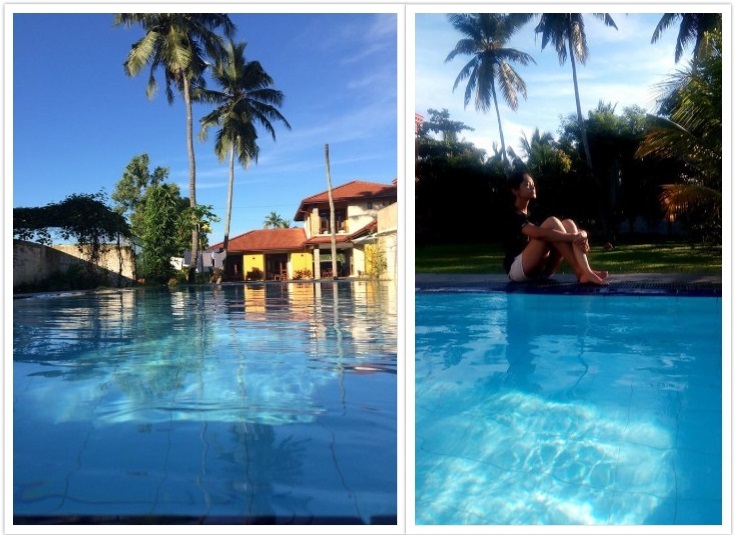 Day 8 -Unawatuna: Privacy and simplicity define the long stretch of the beaches of Unawatuna. It is a diver's paradise in the day but is transformed magically into a lively well lit beach at night . People say that being near the ocean can improve your overall health and well-being , we chose to do just that all day and enjoyed the basic joys of gathering shells on the beach , strolling in the water , spontaneous dips deep into the ocean and chats with local fishermen. Day 9-Galle: We dedicated this day to the Galle Fort and I definitely believe that you need a whole day, if you are the kinds who would want to discover everything from the narrow paths in the shadow of fort walls built first in 1588 by the Portuguese, then extensively fortified by the Dutch during the 17th century to the vibrant cafes and historic museums.The Galle Fort is a world within a world, an experience like no other. I loved the fact that there a surprise that unfolded behind every corner: from colourful tuk-tuks , to old-fashioned cars, to French cafes , to Buddhist hostels and canteens, to luxurious spas all set amid some of the some of the finest Portugese, Dutch and British colonial architecture. Lighthouses ,with their long history and scenic locations have always had this sense of romance associated with them,they trigger a sense of wonder and mystery.The Galle Fort Light house does not disappoint you,with its picture perfect background, the right amount of greenery and the perfect shades of blue we chose to spend a lot of time around the Light House to ensure the image is edged in my mind. 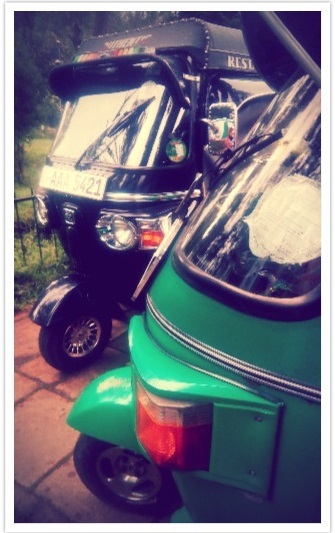 Day 10 -Kogalla - Colombo: Rent a Tuk-Tuk with a chatty driver and you are sure to discover hidden nooks in any town . The last day of any trip is the worst where one begins to relive the holiday, count emails in the inbox and make vacation promises even before the current one is over. However we were determined to squeeze anything and everything more into this day . That is when we met our loyal Tuk Tuk companion who introduced to Kogalla . is bounded on one side by a rocky reef, and on the other by a large lake, Koggala Lake, into which the numerous tributaries of the Koggala Oya drain. A boat ride into the Koggala lake allows yo to stop at a number of slans with their own individual charm, from cinnamon makers to hidden monasteries I was glad we found time to squeeze this in. The reef area of the Koggala region is famous for its stilt fisherman, who erect a single pole in the chest-deep water just few meters off-shore, where they perch on a cross bar and using bamboo fishing rods cast their lines out beyond the surf break to catch small fish mainly sardines. 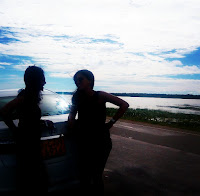 Well I can say that both Shilpa & I managed to catch only a real Lankan tan with NO sign of any fish. 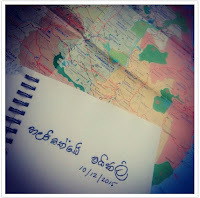 Our Sri Lanka journey was short but this is just a start and I'm glad we chose this country to wander because it has not only given us the courage to set out on a spontaneous adventure but ha also motivated us to plan many more 'no - expectation' holidays.